The Coalition for Jewish Values (CJV), the largest rabbinic public policy organization in America, on Thursday announced a petition drive to preserve traditional standards for prayer at the Western Wall in Jerusalem, and to prevent changes at the holy site for political reasons. The petition comes in the aftermath of the latest round of Israel Supreme Court hearings on the suit by liberal Jewish groups demanding a larger space at the Western Wall, in which justices questioned whether the groups' demands were exaggerated or unreasonable. "We must make a statement, and we were encouraged by leading Rabbinic scholars and community activists to launch this effort," said CJV President Rabbi Pesach Lerner. "Rabbi Rick Jacobs, President of the Union for Reform Judaism, tells Israeli leaders that he speaks on behalf of 'Diaspora Jewry,' and that is simply not the case. Especially when it comes to those American Jews who visit the Kotel, the Western Wall, the vast majority are Orthodox." 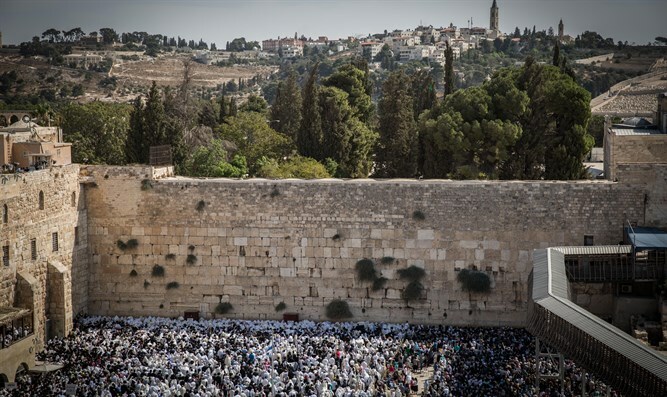 The new petition, available on the CJV website, invites participants to specify their personal connection with the Western Wall while adding their names to the effort. "This is a chance for individuals to make a difference," said CJV Managing Director Rabbi Yaakov Menken. "The majority of respondents are filling in the added survey questions; virtually all have visited the Western Wall personally and pray towards the Holy Temple multiple times every week." The CJV pointed to recent surveys by the Pew Research Center, which determined that only 25% of American Jews are now members of Reform or Conservative synagogues, while the intermarriage rate among the non-Orthodox now exceeds 70%. "They do not even represent the majority of Jews today, much less tomorrow," commented Rabbi Lerner. "We are letting Israelis know that they need not buckle to those American Jews who rarely visit or even pray, yet presume to tell them how the site should operate." "The false claim that their rights are violated emboldens the anti-Israel movement to make equally outlandish claims," concluded CJV Managing Director Rabbi Yaakov Menken. "It is important that American Jews rebut the slander of Israel promoted by liberal leaders." Israel set aside an area for non-Orthodox prayer at the Wall several years ago, but the Reform Movement wants the area enlarged, although it is empty most of the time, and also demands a joint entrance to the holy site as well as membership on the Western Wall planning committee. There are only a few thousand Reform Jews in Israel.